I have made eggs in mugs and tried them in microwave egg cookers. One time, I tried to bake whole eggs in the oven to see if it was an easier way to make hard boiled eggs (it was not). This technique is so simple that I should have thought of it! 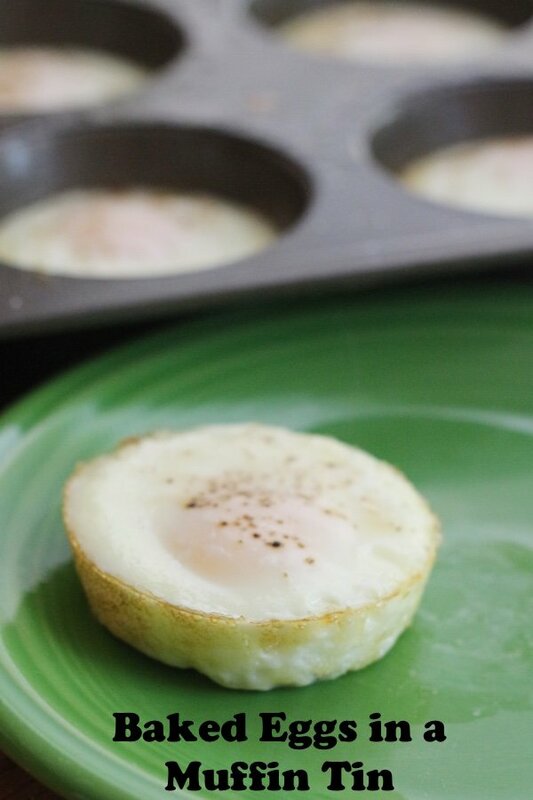 All you need is eggs, a muffin tin, and non-stick spray. You coat the tin liberally with non-stick spray and then you crack the eggs one by one into the tin. Bake at 350F for 17 minutes for a hard yolk and you are done! I loved the way these tasted with my fresh tomato ketchup. The outside of the egg was a little crispy, which my son liked. My husband said he likes fried eggs better but he is super picky about his eggs. These are like the eggs you find in the middle of an egg mcmuffin – which makes sense since you make them in a muffin tin. Stuff one between a whole grain English muffin and you will have a quick breakfast for a fraction of the cost of the McDonald’s version (you will also avoid the salty bacon and American cheese). My son likes his with a little cheese. I slice some cheddar, put it on top of the egg, and heat in the microwave for 20 seconds until the cheese melts. I toast an English muffin. He has declared these better than McDonald's Egg McMuffins. Hurray! You can also customize these by added salsa, mushrooms, green onions, peppers, or whatever you like in you eggs. I like them “au natural” because they are like hard boiled eggs. You can chop them up and add them to a salad or make an egg salad with them WITHOUT HAVING TO PEEL THE EGG. These store well in the refrigerator in an airtight container for about 4 days. My plan is to make this on Sunday and then my family can grab them for an easy breakfast or snack. This is a great addition to my Healthy Breakfast Snacks list. 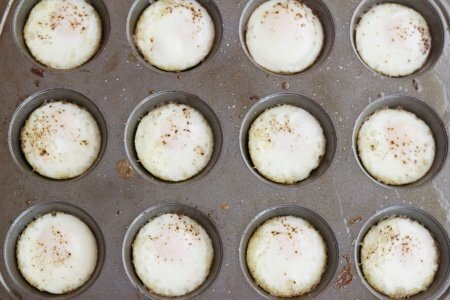 Have you tried to bake eggs in a muffin tin? What did you think? Heat oven to 350 F. Spray a 12 well muffin tin liberally with non-stick spray. Crack one egg in each well and add salt and pepper (if desired). Bake for 17 minutes or until egg yolk is set. Serve immediately or store for a later meal. I never tried just the egg it's self. Great idea!! I have made sauté veggies with egg substitution (egg beaters or egg whites) which turned out great! You can individually pack them in snack bags and place them with in freezer bags, then into the freezer for daily portions. What a great (and simple) idea. I am a terrible cook, can't even boil an egg. It is a joke unless it is actually true. But I might be able to bake an egg. Having eggs cooked and ready to eat is a very low calorie and healthy way to make a quick breakfast, lunch or dinner. By the way, I work with people on weight management issues: breakfast for dinner and dinner for breakfast is a very effective way to lose weight. Also, gathering the family together for a meal is often easier in the morning than in the evening, when people have so many evening activities. 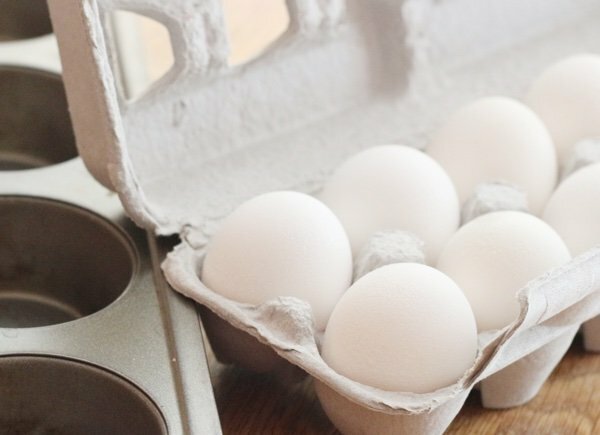 Having eggs ready to go is a great start for all kinds of meals. I notice that eggs seem to be decreasing in price lately, which is a good thing. I have baked a couple of eggs at a time (in a ramekin) and love them. I'll try this for different ways to jazz up breakfast. We make these every month or, so... a little differently. First push a slice of Canadian bacon/ham into the muffin tin, then Crack an egg on top (don't worry if some goes under the ham), then sprinkle a little cheese on top. Not to bad cold, either. I have baked eggs ... in the shell ... in the oven! Instead of HARD BOILING them in WATER ... I do this instead. EASY PEASY! And LESS MESS! Lisa, What a clever IDEA... I am actually going to do this today. Thanks for coming up with such great and clever things..
Ann, I like the idea of canadian bacon and cheese as an option. How long do you bake them? I've made egg "cupcakes"...I scramble eggs, egg whites and milk then pour the mixture into a muffin tin and bake. I've made them plain, with bacon or sausage (pre-cooked), topped with cheese, you can add veggies to the mix...like a baked omelet! Store in an airtight container in the fridge pop them in the microwave to heat! fun idea as well. Thanks! This is brilliant! I can't wait to try this. Oh wow I will definitely try this one. It's unbelievable what you can do in your kitchen with that little food you have. Bake around 17 minutes. Really depends on how well done, you like the yolk. Yoi might want to start checking around 8 minutes, your first time through. Pre-heating the oven right now to make these. Should make mornings easier (and cheaper) this week since I do tend to stop and grab a breakfast sandwich on my way to work each day - thanks! Well, I made them this morning and found that they were overcooked at 17 minutes (plain eggs with vegetable spray, but they all fell out of the cupcake tins when I turned them over, which was great). They had some crusting on the outside, which is never a good idea with eggs. I have a new stove (electric), so maybe I just need to use less time. I took the one that had the least kind of brown crusty bottom and sides, chopped it up and put it in a tortilla with a little cheese. By the way, I rolled it up and then wrapped it in a new coffee filter and microwaved it for a half minute. It was delicious. It is a great way to those old coffee filters that I don't need in my new coffee pot. Next time, i will put some cooked chicken on the bottom of the cupcake pan and some cheese and the egg on top and cook it for maybe fifteen minutes. Whatever, it is a great idea. I can still use the ones that seemed to overcook a bit; will just cut away the kind of crusty part on the outside. Love the time saving ideas that are very simple to make. I want to get our of the kitchen the minute I get in the kitchen, so the quicker I can cook stuff, the better. I usually use Sandwich Thins (whole wheat) for egg meals. They are so healthy and delicious and I discovered they are at Dollar Tree for $1. Most stores charge around $3 for them. Dollar Tree now has fresh bread for a Dollar, as well as the rest of their stuff. can you freeze these or make ahead for the week? How are they kept to stay fresh? Nice! But when I'm just making one for myself, I scramble one egg in a ramekin and put in the mic for 40 seconds. Keeps me from eating fast food when all I have to do is put it on a toasted English muffin with a slice of cheese! 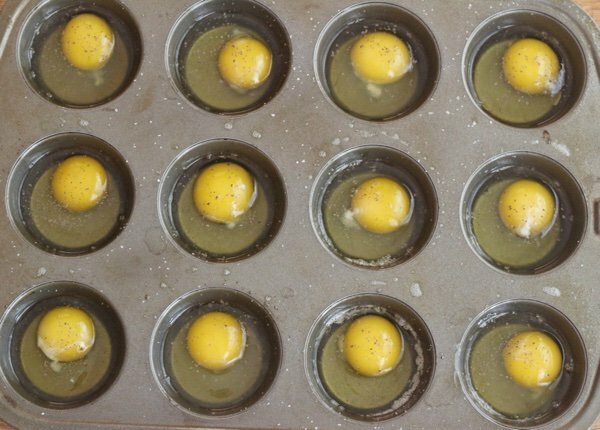 To make on a school day for my son, I'll preheat the oven while I take a shower, then fill 3 of the spots in muffin tin with a slice of Canadian bacon pushed down, cracked egg on top, sprinkle of salt, pepper, shredded cheese (takes minutes, just because there's 12 spots, doesn't mean I have to fill them), pop in the oven, feed the animals, get my coffee & take them out of the oven. If my son asks for extra to snack on later, then I'll put them in a sealed Tupperware container in the fridge. I've never frozen them...though I guess you could. You can buy frozen breakfast sandwiches at the store. These are really the only hot breakfast my son eats during the school week. He prefers smoothies with banana, apple, steel cut oats & Greek yogurt. @Sue - in my oven they were just done at 17 minutes and a little crispy on the outside. Thanks for trying them and sharing your experience - this helps everyone! @Lynn - I don't know what will happen when you freeze them. I am afraid that they will turn rubbery when you reheat them as I have found that with frozen breakfast sandwiches. Thanks so much for the question and I will give it a try the next time I make them. This is a great idea! I've done this twice now; the second time I put a very small dab of butter and a sprinkle of grated cheese on top and wow, it was even more delicious. I've tried this recipe as a muffin "omelette" and prefer the baked eggs. Thanks Lisa! I love your blog.